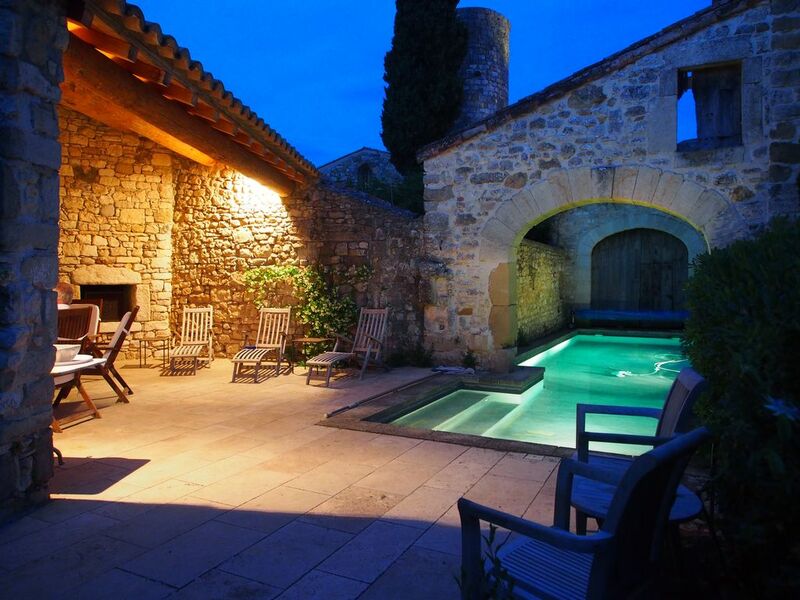 Mas de la Chapelle ~ Beautiful Stone Maison de Maitre with Heated Pool. Completely and respectfully restored. 360 year-old Maison de Maitre (formally a Farm House) with a gated and heated swimming pool ~ together with all the modern conveniences of the 21st Century. Situated in Garrigues-Sainte-Eulalie ~ only 8kms a 14 minute drive from the historic Market Town of Uzès. It’s a 25 minutes drive from the famous Pont du Guard. The Mediterranean, beaches and Montpellier are only an hours drive away. Garrigues-Sainte-Eulalie has its own bakery and a small local vegetable market on Fridays outside the shop. Mas de la Chapelle sleeps a maximum of 10 in 5 double bedrooms. * Spacious ground floor entrance hall with elegant stone staircase rising to upper floors. Window overlooking the swimming pool. * The 1st floor sitting room has open fireplace & CD player. * on the ground floor level:- Kitchen with cooker, fridge/freezer, microwave and dishwasher. * Next to the kitchen is the elegant dining room with seating for 10. Doors leading out to the herb courtyard and up to the pool house and the gated swimming pool. * Utility room with washing machine and tumble dryer. * Pool house with fridge and guest toilet. * Swimming pool (3 m x 10 m). Heated, included in the weekly rental. Rental is inclusive of linen (bedding, bath towels and kitchen linen). Cot available on request. Please bring your own towels for swimming. Absolutely NO smoking in the house. Cars can be parked in our village square 2 min walk from the front door or on the quiet street just past the Mas under the street light. Bath and kitchen towels are provided. Please bring your own pool towels. If required, our Property Manager offers pool towels at €5 per towel. To be discussed and paid directly to her. Nespresso machine. Coffee capsules can be bought in the local supermarkets or bring your own choice of Nespresso capsules. Our Property Manager offers a personalised welcome shopping bag for those guests not able to get to the supermarket on the first evening.Kindly deal/pay directly with her. CD players in the dining room and the first floor Salon. Laid out as a herb garden. Pebbled area for the ping pong table or loungers, if preferred. Romeo and Juliet style off the en suite bedroom (140 bed) on the first floor. On the Pont du Gard 25 minutes from the Mas. 2 courts in the village with owners private key access within a 5 minute drive from the house. We supply tennis rackets (stored in the garage). Uzes has its own public 9 hole golf course within 14 minute drive. Two further 18 hole courses in nearby Nimes. Golf clubs can be hired at the respective courses. Absolutely beautiful property. Quiet and peaceful yet within a short drive of everything one could need and a number of sights. The property is extremely well maintained, clean and very well equipped. We had a wonderful experience thanks to Brenda and her wonderful Property Manager, Carole. Have absolutely no reservations about recommending this property to anyone looking to explore Southern France. A little piece of paradise and history (with a modern touch) combined together in perfect harmony. A lovely and very personal review.....thank you! I will most definitely pass on your kind words to Carole. We so look forward to welcoming you and your family back to Mas de la Chapelle. We had a lovely 9 days at Mas la Chapelle. The house is beautifully furnished and appointed, and extremely comfortable. We also made good use of the outside areas - breakfast and aperitifs on the terrace immediately outside the house, and barbecues in the shaded terrace by the pool. Lots to do in the immediate area - Uzes is a delight. A lovely review - thank you so very much Tessa! Excellent accommodations for the 9 of us. 5 Stars - Will Definitely Return! A group of friends and I just spent a week at Mas de la Chapelle - I can honestly say it couldn't have been better! The house is spacious and feels like a home away from home. The place is equipped with everything you could possibly need, and the outside area is perfect and beautiful (look at the photos!). We spent almost all of our time outside by the pool, and in the evening the large outside table is also great for outdoor dinners (BBQ included!). Bikes are provided so we made good use of them to explore the surrounding countryside and for easy trips to the nearby bakery in the morning. Location-wise there is a bakery very close (walk or bike in about 5 minutes), and the picturesque town is also close for an easy evening or day trip. We'll definitely be coming back next year! What a lovely review, thank you so much! We look forward to having you and your friends back next year. Our visit to Mas de la Chappelle exceeded our expectations. Brenda and Bas have a beautiful and very comfortable French country home. We are a family of 6 adults (parents plus 2 adult daughters and partners) and we had lots of room in this lovely home. Each of the three couples was able to have their own bathroom and there were 2 sitting rooms each with plenty of room for the the 6 of us. The kitchen is well stocked with cooking utensils to make any meal you can think of. The pool, patio and terrace are lovely to relax and unwind in the sun. There is an excellent boulangerie in walking distance. Everyday, we took turns walking to the boulangerie to pick up morning pastries to enjoy inside or out. The surrounding villages are charming as well as the wineries. The Uzes market is amazing - the best Provence market we have seen. As well it is an easy drive to Nimes or Arles to see Roman artifacts. But the best of all is the charm of the house. The almost 300 year old house has been carefully and lovely restored with interior stone walls, curving staircase, and interesting alcoves. It is decorated with antiques and lots of French country charm. At the same time, it has all the conveniences you need such as heated pool, large outdoor terrace, gas BBQ, TV, Internet, microwave, laundry facilities, bicycles. It is in a very quiet village and at night you will be stranded by nothing more than the sounds of birds and the beautiful aromatic breezes from the nearby vineyards and farms. Our family thoroughly enjoyed cooking gourmet meals together, playing games int the upstairs lounge, relaxing on the patio with our aperitifs and chilling out in the lovely drawing room. We couldn't have asked for a nicer place to celebrate our daughters engagement announcement. Brenda and Bas - we thank you sincerely for opening your home to us. It was an absolute delight to be able to enjoy your family in your lovely and very welcoming home. We all said that we hope we will be able to return again some day soon. Au revoir and merci! Thank you so very much for your lovely review. It was an absolute pleasure having you and your family at Mas de la Chapelle. We look forward to your next visit ~ and who knows, it's possibly an ideal place for your daughter's wedding or honeymoon 😉�. Nous avons passés 10 jours magnifiques en famille. Les photos correspondent très bien aux prestations et la piscine à beaucoup de cachet. La maison est très bien située dans un endroit calme très proche dUzes et de Collias pour la baignade en rivière. A recommander. Thank you so much for your kind review and recommendation Barth. We look forward to having you and your lovely family again!